Strong body and durable construction - built with heavy duty 304 stainless steel (16 gauge). Chef base top is manufactured of one piece reinforced stainless steel to ensure durability. Drawers - small drawer holds up to 154 pounds. Large drawer holds up to 242 pounds. Countertops - TCBE-82SDR and TCBE-96SDR support up to 1,192 pounds. TCBE-52SDR supports up to 788 pounds of equipment. 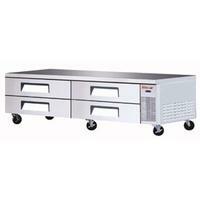 Durable stainless steel drawers - drawers are easy to clean and assemble. Top is insulated to eliminate heat transfer to the interior of the cabinet. Refrigerator holds 33 - 38 F for the best in food preservation.